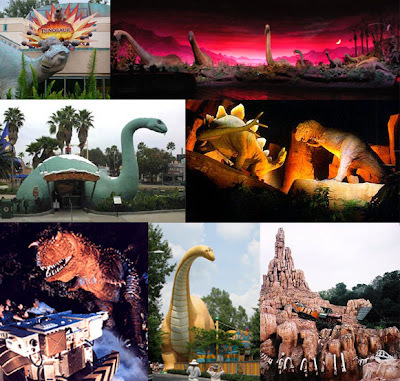 Universal Studios may own the naming rights to Jurassic Park, but Walt Disney World has always been dinosaur friendly. Did you know that all four theme parks have full-sized dinosaurs on display somewhere inside their gates? Animal Kingdom has the obvious ones. And Epcot should also be easy. The Studios may take you a moment, but then you’ll realize that it too is obvious. Magic Kingdom is the tricky one (and Timekeeper is long gone, so you can’t count the T-Rex that shows up in that CircleVision movie). But you can do it. Go ahead, think it through. I’ll wait. This entry was posted in Disney Theme Park Hidden Secrets and tagged Animal Kingdom, Disney's Hollywood Studios, Epcot, Magic Kingdom. Bookmark the permalink. ← Does the Original Star Tours Break the Star Wars Canon Timeline? Now that Ellen’s Energy Adventure is shuttered, are there any other life-sized dinos at Epcot? Wracking my brain, but can’t think of any. There’s a woolly mammoth at the start of Spaceship Earth. Does that count? Thanks, Julia! we used to be able to extend this trivia question to the California parks as well, but DCA recently ripped out Dinosaur Jack.